The previous post outlined the overall structure of the world religions with the diagram shown above (Figure 3) This structure can be studied in more detail. The theological semiotic square provides a way of understanding the four world religions and how they relate to each other. Every religion has its own semiotic square and so there are semiotic squares “within” the semiotic square. Take Hinduism for example. The One in the One-is-One doctrine is the Brahman, the impersonal god that cannot be worshipped directly. The Brahman can be comprehended in the form of a triad of personal gods consisting of Shiva, Vishnu, and Brahma. 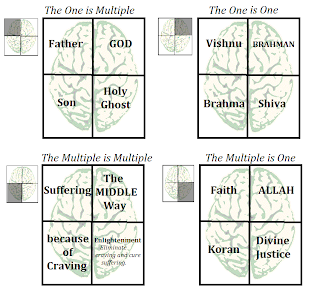 This leads to the semiotic square in Figure where Vishnu occupies the same front top slot as did the Christ god and Shiva occupying the same back left slot as Allah. Brahma, who is rarely worshiped takes up the Buddhist slot. Theologians warn that this is an error. The Christ god and Vishnu are quite different as are Shiva and Allah. The semiotic structure shown in Figure 3 corresponds to a very unconditioned reality, Figure 4 shows four semiotic squares, one for each entry in the first semiotic square. Each such entry corresponds to a qualifying context for the four more qualified structures. Each of these four semiotic squares corresponds to a whole and should be comprehended in isolation as they are mutually exclusive. You can’t be a Christian and a Muslim in the same instant. Each semiotic square is shown with a small accompanying square representing the qualifying context. With experience with these structures, further reading of the material presented here, practice and some guidance from an instructor, the student should be able to start providing detailed explanations concerning the mythical beliefs and imagery surrounding theological structures. For example, why is Vishnu and his reincarnations such as Krishna all dark skinned and Shiva vivid white? Why does Vishnu have reincarnations and Shiva none? Why does the Christian god have an offspring and Allah none? The Koran in the Islamic trinity is divine substance. The book transcribed by Mohamed is a combination of symbols that only approximate divine substance. Expand. Last of all, why are the principle deities featuring in major religions all male? Any well versed theology or divinity student should be able to provide some kind of reasonable response to these questions. It is hoped that the material provided by the author will expand the horizons somewhat. The author also hopes that the layman, together with the theoretical physicist might also profit from the experience. 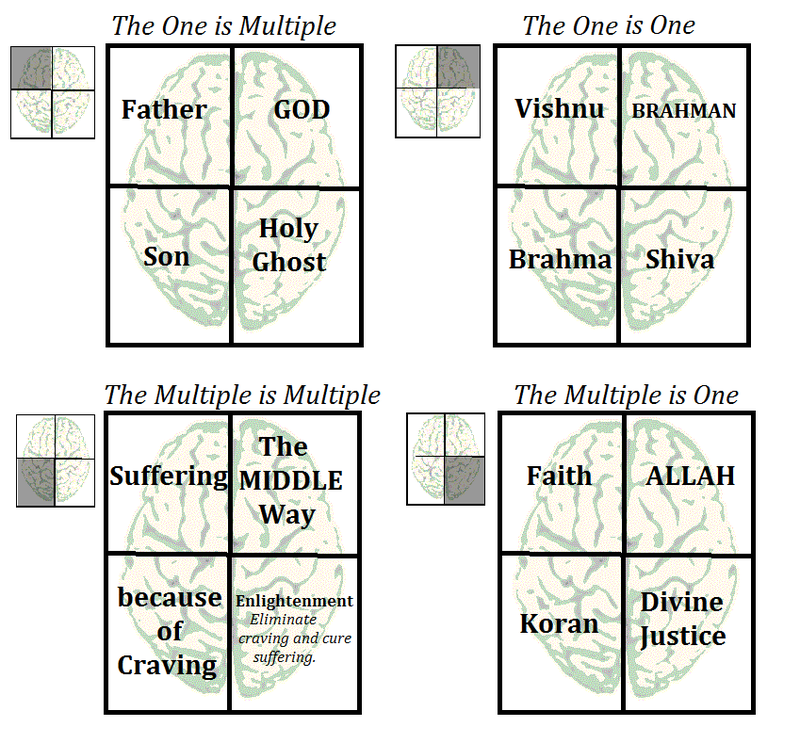 Figure 4 The godhead of each of the four world religions. Taken together with the unqualified semiotic square in Figure 3, the overall structure feature a configuration of five squares. Back in medieval times, The Indian Shankara put forward a non-theological version of this structure in his Theory of the Quintuple Dosage based on a theory of five intertwining elements. As a matter of passing interest the diagram can be found in the author’s previous book (Moore, 1992) and elsewhere. In the previous section, we have started exploring elementary cognitive or generic structures and their interplay with reality. The theological semiotic square has provided a way of understanding a holistic view of reality and that are four fundamental “takes” on reality. These four worldview paradigms are mirrored in the four world religions. In present day scientific circles, it is generally thought that there is only one kind of science worthy of the name. These are the traditional empirical based sciences that we have been referring to as left side sciences. Left side sciences are considered as objective as they study objects under controlled conditions that remove any possible subjective factors. As such, left side science specialises in the domain of objects where any reference or involvement of the subject has been eliminated. The operational paradigm here is science without subject. Such sciences end up in a single opposition between two different kinds of object. The objects involved are the real object and the imaginary object. Left side science is dominated by a duality between the real and the imaginary. The duality between the real and the imaginary runs right throughout the science and appears in many different and sometimes surprising guises. 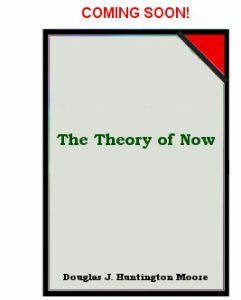 In the first instance, it appears as the dichotomy between the object of a science and the theory of that object. The object is considered as belonging to the real whilst the theory belongs to abstraction and hence is imaginary. This primary opposition resurfaces in Analytic Philosophy in another guise as the Mind Body problem. Classical physics provides the most dramatic expression of the Real Imaginary duality. According to the classical physics doctrine, all entities have properties. In physical reality, only entities are deemed to exist, whilst properties, not being entities, are deemed not to exist, In other words, entities are real whilst their properties are imaginary. This is an amazing situation as the only way that classical physics can get to know the real component of reality, the entities, is via perceiving and measuring the attribute. Real world entities can only be known via their imaginary component. This is left side science at its purest and most intriguing. Not only does the science lack a subject, it has to content with a second rate access to real objects. The whole system bathes in the imaginary. There might be two halves to the world, but we can never know more than one half, the imaginary half. The opposing paradigm to the Science without Subject doctrine leads naturally to Science with Subject. This is where we find right side science; the paradigm that insists that Subject must be present with Object at all times, and treated on equal terms. It is at this point, right at the beginning of the presentation, that we see the essential difference emerging between left and right side reasoning. The left side cuts the world into imaginary and real chunks, and only retains the chunk that it feels it can know, the imaginary. This left brained beast can only know what it feels. This creature lives in a half world that keeps on fracturing into finer and yet finer distinctions. Contrary to the fractured atomistic half worldview of the left side, right side science specialises in always seeing the world in the form of wholes. The wholes are reminiscent of Leibnitz’s monads “without windows.” Each offers a holistic view of the universe. Both the left and right side paradigms agree that their world is split into two, the imaginary on the left, and the real on the right. This is where the two paradigms part ways and enter into two different worlds. The left side takes refuge in the left side, satisfied with the half world of abstraction. The right side paradigm must also make its home on the right side. However, unlike its tunnel vision sibling, it is conscious of a bigger world and its domain of influence extends over the whole world. It is even conscious of its sibling and acknowledges left side deftness in dealings requiring finer, crystalline aspects of reality. On the other hand, the left side is prone to believe that it is an only child, and often behaves accordingly. This is particularly notable for left side science. The critical step to obtaining a holistic view is to introduce a second cut, orthogonal to the first. The first cut determined the dichotomy between impersonal subject on the right and its corresponding object on the left. The second cut determines the personal subject at the front and its corresponding object at the back. Instead of two takes on reality, the paradigm provides four takes. We have returned to the semiotic square structure. Just as for the left side, the concept of the real and the imaginary emerge. This time the real becomes associated, not with the impersonal subject, but with the confluence of the impersonal subject with the personal. This corresponds to the front, right hand corner of the semiotic square. Now, the left side paradigm declares that the real can only be known via the imaginary side, via attributes, abstract theory and so forth. The right side paradigm has its own take on this matter. The real world is no longer that thing out there seen from the God’s eye view from nowhere. The real becomes relativised to the personal subject. The real becomes the identity of the personal subject with its reality, the impersonal subject. This becomes an expression of Shankara’s principle of non-duality expressing the formula the One is One. The impersonal reality and the reality of the personal become indistinguishable. This is real, all else is illusion, Shankara’s Advaita Vedanta declared. For consistency, we prefer the term imaginary rather than illusion. Then suddenly, we hit the goldmine. Left side, after cutting itself off from the real has to content itself with knowing the real via empirical attributes flowing from god know where and what. The right side paradigm does not need to go out there rummaging through the dustbin for leftover attributes in order to understand the real. The right side already has three attributes in immediate possession. This can be seen from the semiotic square produced by the two fundamental oppositions. Relative to the personal, real subject in the front right hand side of the square, there are three other boxes left over that provide an opportunity to get to know the allusive One is One entity. These three boxes can be thought of as three attributes of the real. They can also be thought of as imaginary. Thus, in summary, left side knowledge exhibits essentially a one kind of fundamental dichotomy, that between Body and Mind, the real and the imaginary, the concrete and the abstract. Knowledge of Body, the real, the concrete is via empirical attributes. One the other hand, right side knowledge exhibits a fourfold structure where the real appears as relative to the subject and there are three a priori generic attributes, applicable to any determined subject. The generic structure thus involves the real entity with three imaginary entities. This four-fold structure we interpret as the epistemological brain. 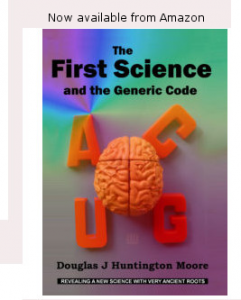 In a moment of foolhardiness, we also interpret the biological brain to be organised along these same generic principles. Moreover, the right side of this structure is capable of comprehending the whole structure in these terms. The left side is anchored in an atomistic view of reality and is incapable of such an overview. The left side, be it epistemological or biological, by its very nature cannot be conscious of the whole. Many years ago, the author’s first glimmer of understanding came from some quite elementary mathematics. The details can be found in the Appendix. Very briefly, it concerns the nature of number. Students are taught that there are two kinds of number, real numbers and imaginary numbers. Imaginary numbers are necessary in order to provide a tractable number for the square root of negative numbers. Numbers made up of a real and an imaginary part are called complex numbers. Most students, even engineers and scientists, go through their studies only knowing about complex numbers and that there is only one kind of imaginary number. This is left side mathematics at work. In a later post, the right side slant will be presented, free of any metaphysics. In this case, you get hyper-complex numberswith one real and three kinds of imaginary number. Both the left side and the right side version of real and imaginary numbers should be included in a balanced education.